They sit quaffing shots of caffeine, typing feverishly into MacBook Airs. Groups of Web developers, impact investors, social entrepreneurs and creative types huddle around peanut-shaped tables, percolating ventures. Others slump on bean bags in meeting rooms, while those who pedalled to work pulley up Trek bikes to park them on the ceiling. Welcome to The HUB Singapore, an incubator space for those in the business of doing good, seeking solutions to world problems and trying to forge unconventional career paths. Less than a year ago, a pint-sized girl with an outsized dream started her venture at the National Youth Council Academy in Somerset Road. 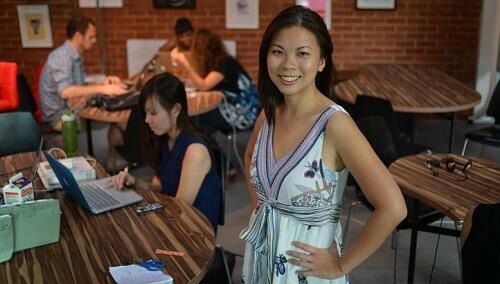 What Ms Grace Sai, 29, a Singapore permanent resident and Malaysian national, had in mind was a collaborative space which supports fledgling businesses with a social mission, hires out shared workspaces and holds weekly community events. In May last year, she started with just 30 members. Since then, membership has grown 11-fold to 330 in 11 months. The "Hubbers" - two-thirds Singaporeans and permanent residents, the other one-third foreigners who have set up Singapore-registered businesses - pay about $25 to $600 each month (depending on usage). The HUB here, the first Asian outpost of a global network that began in London in 2005 and has grown to 36 branches worldwide boasting 6,000 members, is "agnostic to discipline", as Ms Sai puts it. Anyone is welcome as long as they want to leave some positive impact on the world. Intent and purpose matter most, not legal entity (such as whether the set-up is non-profit or not), educational qualifications or profession, she says. In fact, The HUB here is itself a for-profit company, which Ms Sai and four other partners own. It recently received a $100,000 grant from the National Youth Council, but runs largely on membership revenue, which totals over half a million dollars this year. About two-thirds of the initiatives housed there are for profit too. "We like people who make money, for a purpose," she says. Some of the social enterprises based there now include PlayMoolah, which uses online games to teach children financial literacy; Newton Circus, a sustainable technology consultancy; Gone Adventurin', which organises adventure holidays with a difference; and NDI, which provides solar lamps to rural Indonesian villages. This 5,400 sq ft place has spawned many collaborations since its inception, thanks to shared ideas and bartering of services in the hallway. Insead professor of entrepreneurship Philip Anderson, 56, who is an adviser with The HUB, says it has changed the game here because entrepreneurship can be very lonely. "Having a lot of sounding boards who understand what you are trying to do is enormously helpful for someone who is building a social venture," he notes. But The HUB is really a conduit to Ms Sai's true passion - helping people to discover theirs. "Don't ask what you can do for the world; what the world needs is for you to come alive," she often exhorts in her talks to student leaders. She is convinced that "if people are truly honest with themselves, they will want to care for the world. But most people are afraid to know themselves. They just make a living, not live. Alive people have a lot of energy". She thinks unlike in previous generations, where job security was key, more people can now evaluate how they want to use their lives for the betterment of humanity. "This group of change-makers are getting younger. They are not going to wait till 60 to give back. They're going to use their youth, creativity and energy to do it right now." She hopes The HUB gives these folk that "extra dose of courage" to take the leap. She also serves as a mentor at Insead and the NUS Entrepreneurship Centre, to try to bestow the "right world lens" to future business leaders. She is also organising internships at The HUB for civil servants because she wants them to see that "innovation that happens at the periphery of things, around collaboration and communities, is just as important as what is engineered top-down". So does what she advocates - quitting the day job to change the world - apply to everyone? No, she says, aghast. "Not everyone should be an entrepreneur. The world will be so chaotic. What I mean is being honest with yourself and pursuing your passion, which can mean being the best banker, oil trader or window cleaner. You can be very in the flow because it's your calling." But should all passions be pursued? Aren't there exceptions? She ponders that. "Well, like painting," she allows. "If the problem is with skills and talent, then keep it as a hobby," she says, but adds that unfortunately many give up too easily in making their passions commercially viable. What about those who charge she can do this only because she's young, single, with no mortgage? She groans. "I stay away from these people. You will go insane. If you want to pursue your passion and do good, surround yourself with like-minded people who have the same values. It takes a lot of courage to live a life that you want," she asserts. Oh, and who said anything about being poor to do good? She challenges the assumption in Asia that being a social entrepreneur means a "sub-standard life". "In fact, people who want to do good should take a premium, not a discount. They should be celebrated, not frowned upon," she volleys. She is upfront that she wants to make a comfortable living too, though she qualifies, "not as a goal but a by-product". She adds that she is lucky her "passion, skill set and market opportunities overlap", so she now draws a higher salary than before as CEO of The HUB (in which she owns equity with her partners) and speaking engagements. But will it all flame out, once the trendy buzz surrounding social entrepreneurship dies down? No way, she shakes her head. "It is going to be the future, I'll put all my money on this, man." "My vision is that one day every business will be a socially inclined business because that's the only way to survive. No economy can flourish if the social and environmental fundamentals are not stable... Because the people understand the world better today, they cannot be cheated or lied to any more. You cannot go on exploiting the market without creating real value for society." If she has one wish in her lifetime, it is to change how success is defined. She was encouraged to set her own agenda from a young age. Growing up in Ipoh the fifth of six children, her secondary school vice-principal dad and kindergarten principal mum would turn their home into a theme park. The taps would be turned on to make the bathroom into a pool that people could jump in from the window. Mattresses doubled up as slides. Each child took charge of one room, sold tickets, competing to see who would make more. At 17, she was the first of her siblings to come here on an Asean scholarship to enrol at St Andrew's Junior College. Then, she read business at Nanyang Business School on a student loan, giving tuition, selling education programmes at roadshows and writing up case studies for international marketing guru Philip Kotler. She became the bane of her classmates because of her love of asking questions. "They thought I was showing off and preferred to go home to e-mail the professor in private," she recalls. She felt so "stifled" here that upon graduation, she took a branding consultancy job in Jakarta for a year. Then, she helped her older sister set up a telecommunications business in Indonesia, but felt unfulfilled. The answer came to the 24-year-old in a dream where she saw a building with many rooms for children to study in. She woke up in a sweat, wondering how to bring literacy to children born in remote Indonesian villages. Taking a leaf from the book of American John Wood who left Microsoft to start non-profit Room To Read, she adapted his model of partnering villages to build libraries, to Indonesia's slums. Within three weeks, she set up non-profit Books For Hope, amassed a team of volunteers and 3,000 donated books - "a sign that universal forces are showing you that is the right path", she says. She kept her day job working for her sister, but spent weekends carting books into jungles. Within the year, she set up 12 libraries, which have grown to 26 libraries from Bali to Komodo five years on. What excited her was running workshops to teach villagers about entrepreneurship and helping to narrow the rural-urban gap. Two years later, when it was up and running, she left it to the local board and left for Oxford University to do her MBA on a Skoll Scholarship for social entrepreneurs. There, she found her "label" and got a "glimpse of what I can become", she says. On a school project trip to San Francisco, she stepped into The HUB there. Groups of people were chatting animatedly, being pitched to, or in a conference call with Ghana. It was electrifying - "the kind of energy that could make anyone believe that anything is possible", she relates. When she learnt there was no HUB in Asia, the 27-year-old brought it to Singapore last year, just ahead of Seoul and Tokyo. It took her 400 coffee chats over nine months persuading social entrepreneurs, investors and other professionals here to come on board as members, investors or advisers. After she raised $250,000 and registered it as a for-profit company "to prove that business can be used for good", the National Youth Council offered her funding and a subsidised space. Such is her charm that, over coffee, she managed to persuade a former reinsurance brokerage managing director to change course and fulfil his barista dreams. He ended up setting up a coffee bar at The HUB with a sustainable angle: He recycles his coffee grounds into stirrers. Likewise, Ms Sai, who bikes to work from her Tiong Bahru rental walk-up, does yoga, rock climbing, rowing for fun, and is currently dating a Canadian venture capitalist in Silicon Valley, tries to live courageously. Often, people ask her if they need to worry about money if they pursue their passion. Her short answer is: "If you pursue your passion, you will be so good at what you do, the money will come. Every challenge will be like a game for you. When you're doing what you like, you're unstoppable."